My first MAC polish is a fact 😀 Woo hoo! I’ve been drooling over their Limited Edition shades for quite a while and when I saw Submerged I just had to have it. It belongs to the Alluring Aquatic Collection. Besides this one, there are two other shades to choose from. I had high expectations for this one. It is kinda pricey you know. Color wise it’s gorgeous! The color shift isn’t extremely noticeable but it’s still very pretty. To me, the formula seemed a bit sheer. 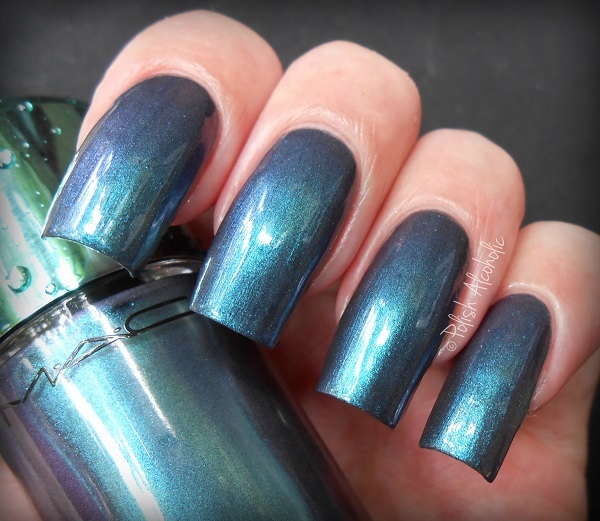 I think you can reach full coverage with two coats but I used three thin coats plus top coat here. Oh lord, I am a real sucker for fancy packaging. The box AND the cap have a water droplets look. I am in love with this. I guess I am that crazy. I mean, take a look: LOVE! 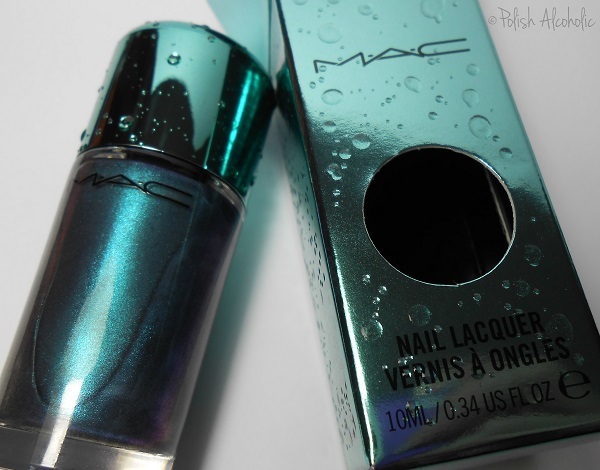 This entry was posted in MAC and tagged mac, mac alluring aquatic, mac submerged, nail lacquer, nail polish, polish alcoholic, review, swatches by Polish Alcoholic. Bookmark the permalink.